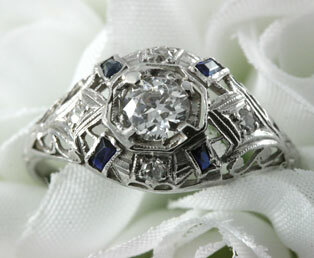 Lacy, light and romantic describe this 1920s ladies old diamond filigree engagement ring. A fiery old-European diamond draws your attention to the center of this ring. This 1/2 carat old diamond is mounted in an Art Deco octagonal mounting. On each shoulder of this ring is a stylized lotus flower holding a single cut diamond. Four rectangular-cut blue sapphires embellish the center diamond by adding splashes of color to this elegant engagement ring. Diamond centered filigree ribbons link together the blue sapphires are found on both sides of this ring. A chevron design decorates the ring shank. Fine crafted openwork 14kt white gold filigree completes this special ring.